Bye, bye lawn. It took two guys about six hours to dig up the turf. 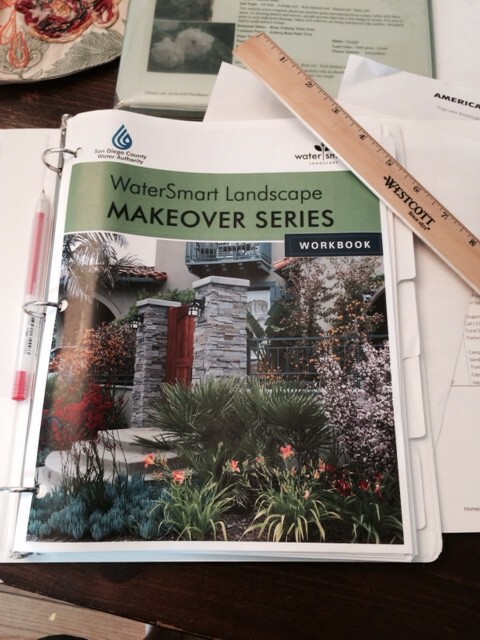 I attended my first WaterSmart Makeover Class a few weeks ago. It was really inspiring, so inspiring that I went home and ripped out the grass in the front yard! Actually, I learned that you don’t have to do that. There is a way to eliminate your turf without the expense and hard labor of digging it out, but that is for the next class. The class is put on by the San Diego Water Authority and started with an overview by the Assistant Water Resource Specialist Joni German. I won’t get into all the details of the drought in the state of California but for San Diego, I learned some interesting facts that explain why my Hydrangeas look dead and my vegetable garden won’t grow the same way it did. First of all she explained that the rainfall in San Diego this year is actually above average! We usually get 10 inches a year and this year we have had 11 inches already. Then why do my plants look so crappy? It is because our temperatures have been hotter than normal for the last fifteen months. 2014 was the hottest year on record for San Diego. This heatwave, combined with our water conservation efforts, have left my garden looking horrible. It’s definitely time for a change. Drainage test. 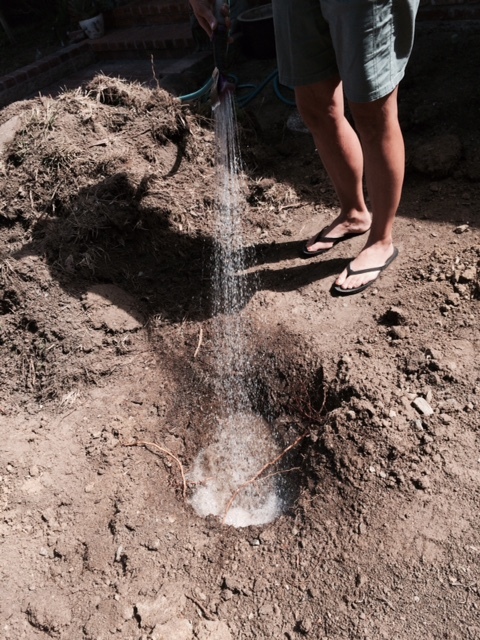 Dig a 12 X 12 foot hole and fill with water. Let sit 8 hours. Then fill with water. Let sit one hour. Measure how far water has gone down. Look up your results on drainage scale. Next class is on landscape design–I’m so excited. The third class is where we put our skills to work and show our design plans to an actual designer. We each get thirty minutes of consultation. The final class is on irrigation. If you are considering replacing your lawn with water-wise plants, I highly suggest you sign up for this free WaterSmart Makeover Class. It is a very useful and interesting class and it’s FREE. You can’t beat that. You get dinner too. The next class is on my 15th anniversary. Your spouse can go with you. I’m sure it will be a very educational anniversary. Maybe I can bring some champagne! Now we are on a fast track for turf removal. 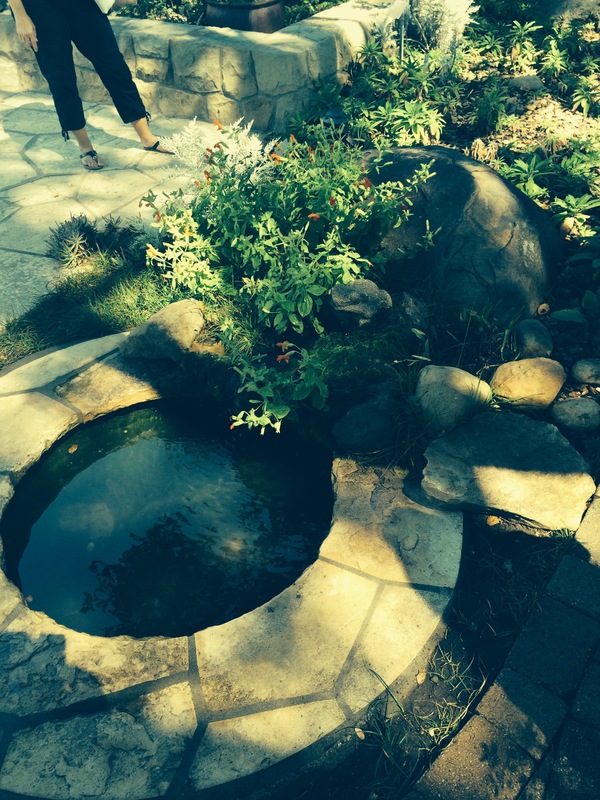 My first waterwise landscaping class is September 23. 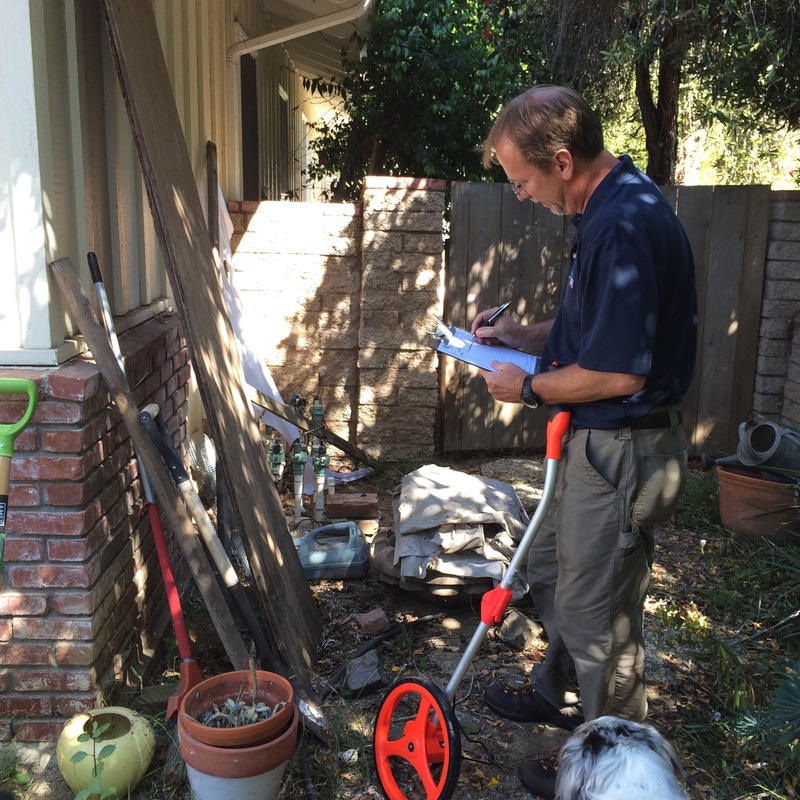 The class comes with a survey of your yard to help you make your new landscaping plan. They came to survey our yard last week and let me to take a picture to document the process. See Cleo in the picture? She can’t stand not being in the middle of everything! They tested the water pressure of the sprinklers too. Now I just need to speed up time so I can go to class and make my plan. Back to school for me too! With the turf replacement rebates from San Diego Water District and the state, we are thinking of replacing our turf in the front yard with some lower-water use plants. Since I have a cottage garden, I need to find something in this style. I don’t want rocks like above, but I liked that fake stream, which we might put on our hill one day. I recently went to the Master Gardener demo garden at the Flower Fields in Carlsbad for a look at different water-wise plants from different regions: Mediterranean, South African, Australian, native… it’s a good way to learn about different plants from different regions but not so much about landscaping. 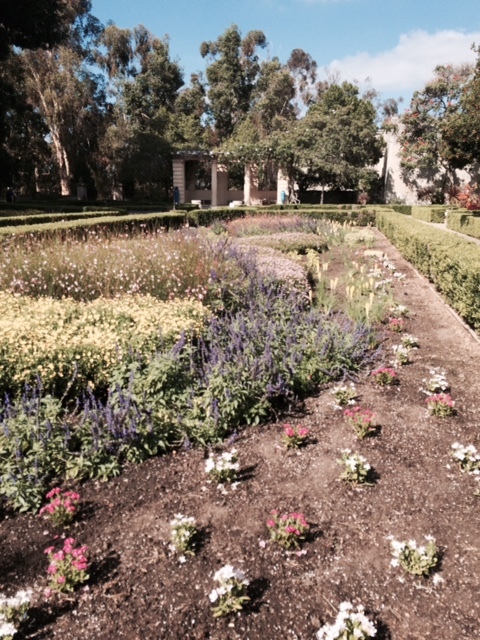 Over the weekend, I went to Cuyamaca College Water Conservation Garden in Rancho San Diego (www.thegarden.org), which was tremendous and I recommend going. Below are photos of plants that want to remember for my yard: African daisy and creeping germander below. 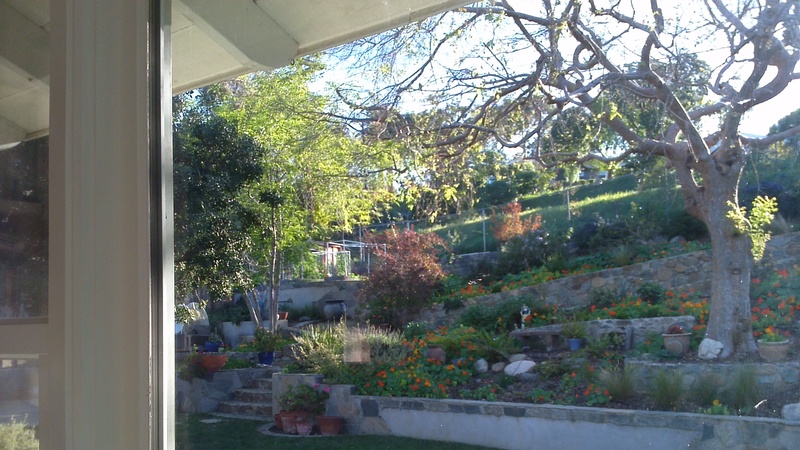 My landscaping idea is to replace our turf with patchwork meadow of water-wise groundcovers. We will also add a much needed walk-way meandering through it. The trick will be to find ground covers that look good all year and don’t die down in the winter. I will need some evergreens and hearty heat-lovers. A very cute bunny topiary with two other cute bunnies on display in the topiary garden. I like the fern below. Once established, some types of ferns do not require much water. This is a Wooly Lip fern. There is a lantana in the front (purple ground cover). The blue fescue grass in the lower left of the next photo will probably be one of the main grasses in my front yard meadow. Then I think I will plant Santa Barbara Daisies and blue geranium incanum with it. In the lower left part of the photo is snow in summer ground cover, but it doesn’t live for more than a year or so and it needs water. Maybe that’s why it is under the pink bush. The plant below with red flowers are a type of protea from the South African garden–great for flower arrangements, too. These would be good on our hill. 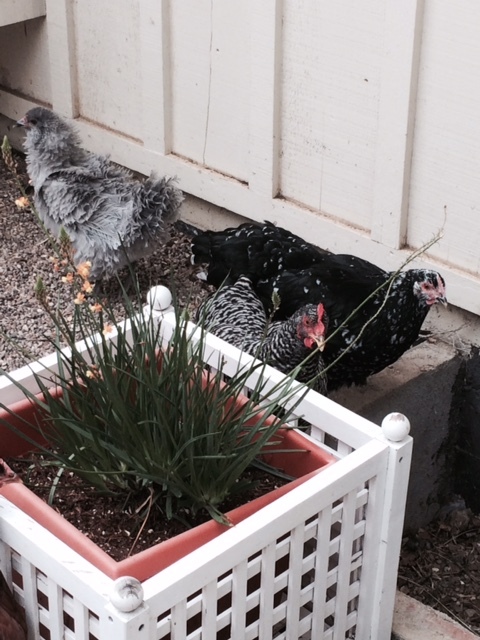 The next photo with the “bee hive” is of a herb garden with thyme, rosemary, etc. 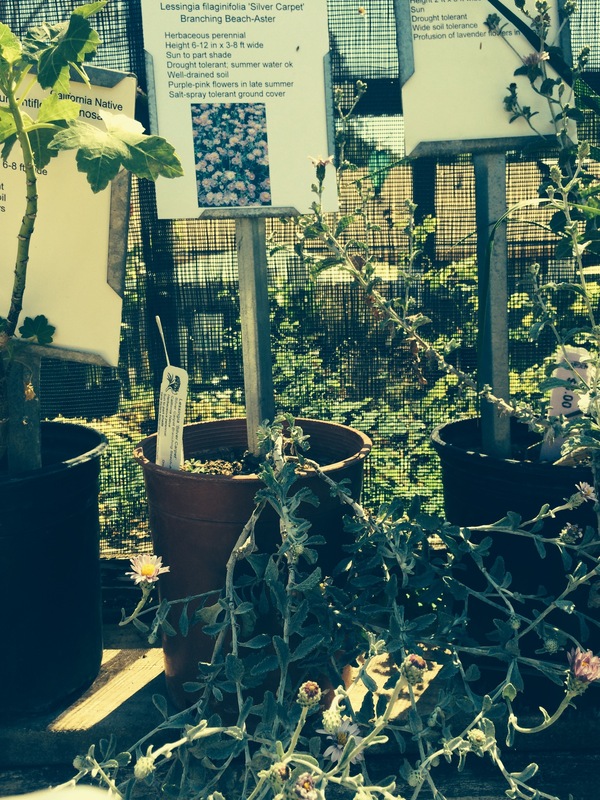 The Cuyamaca Water Conservation Garden will have a Butterfly Event in May 9 and also the college has a spring garden festival coming up. They sell plants too. As I am writing this, I realized I missed the meadow garden. I was on the way to see my horse, and I had three little girls with me so I was in too much of a hurry and a little distracted. Oh well, good excuse to go back! If you know of any groundcovers that would look good in my meadow, let me know! I want ones that will look good in winter and summer. My friend was visiting my yard a few weeks ago and she said, “Wow. You really worked in your garden a lot this spring. You have so many flowers.” Truth is, I haven’t! I have mostly been crawling around on my hands and knees pulling weeds. The flowers I have are self-sowers or perennials that re-seed. Every spring, they come up and I just sit back and pull weeds out so they can grow. Below is a native purple geranium ground cover that also grows all over my front yard. I love native geraniums because they re-seed. You can also see lavender mixed with it. Lavender will also re-seed and you can transplant the baby lavender as well as the geraniums around the yard to fill in bald spots. 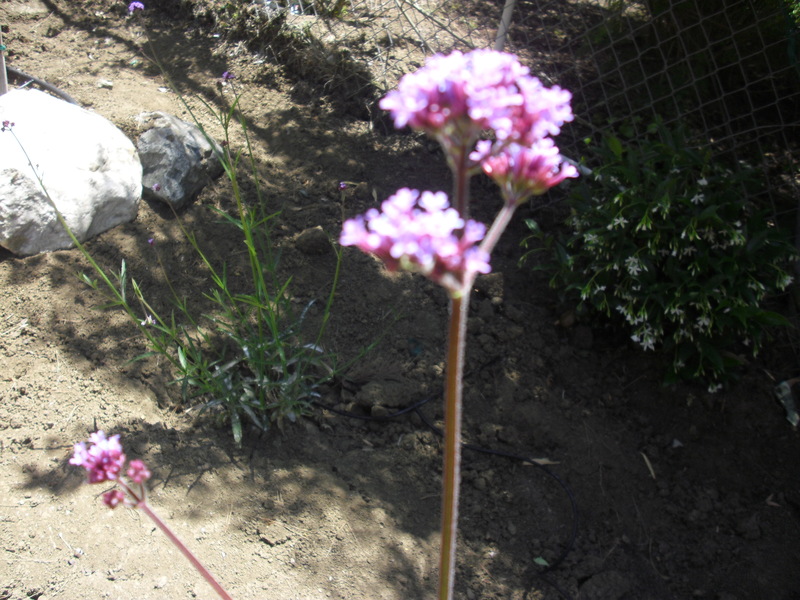 Another great re-seeder is verbena. I just learned that the type of verbena that I have growing naturally in my yard is called Moss Verbena. It is drought tolerant, according to the new book I just bought Water-Wise Plants for the Southwest, by Nan Sterman, Mary Irish, Judith Phillips and Joe Lamp’L. Nan Sterman is in San Diego so her advice is particularly relevant. GROWING TIPS: What are the secrets to re-seeding these plants? You have to live with a little ugly when the blooms die. Just let them go to seed and let them get brown. Then when you cut them, leave the cuttings out where you want them to re-seed. You don’t have to do this forever, just until they dry up a little. For example, have you ever noticed that when you cut lavender and bring in for a bouquet, after a while you see little black dots all over your counter? Those are the seeds. They are miniscule. When I trim back all the lavender after the spring blooms, I thrown the stems in the ground for a while so the seeds fall out. Same idea. native geraniums; geranium incanum; also Bill Wallis geranium as referenced in my post on Annie’s Nursery; oh great, geranium incanum is also invasive according according to the link above. Oh well, I can live with invasive. I can’t live with dirt! 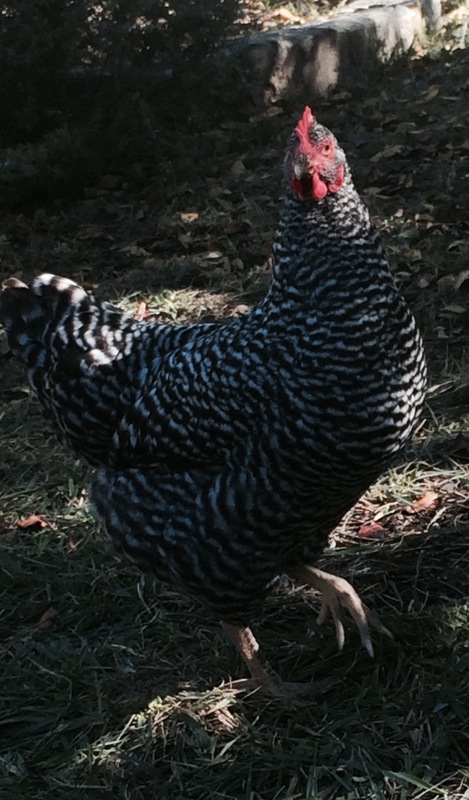 The hens might help. I find little tomato plants growing from seeds that they pooped out growing all over! Mother-in-law’s Squash Tip: Plant squash in mounds. Put five or six seeds in each mound and place a stick in the middle of it. That way you can find where you planted it. I think that makes sense, right? At least it did when she told me on the phone yesterday. Now that I write it down, it doesn’t. But I’m going to give it a try. 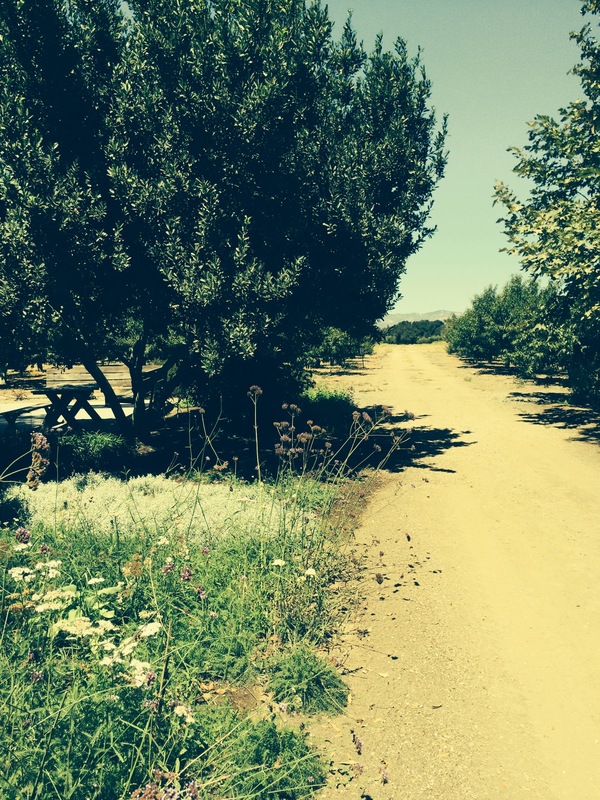 This is a pictorial of beautiful places around Santa Barbara and Santa Inez Valley. 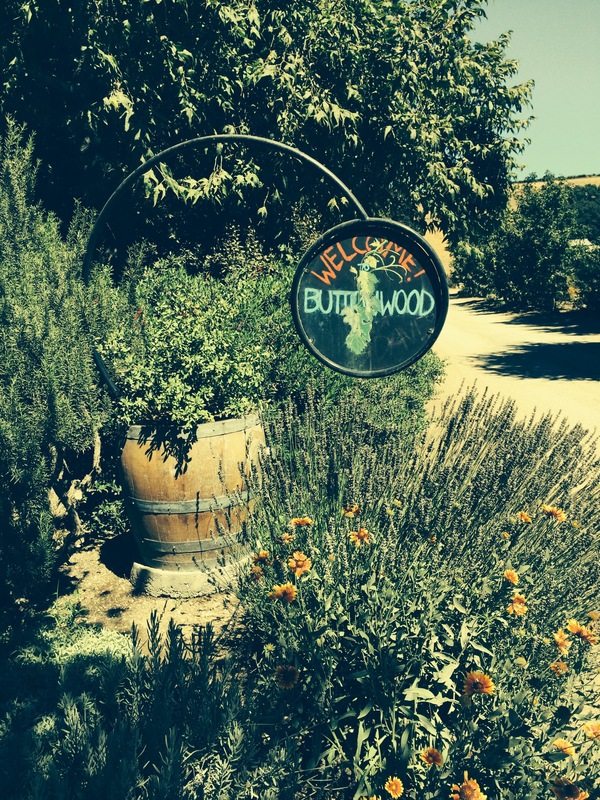 Enjoying the day at the Buttonwood Winery & Farm in Santa Inez Valley. 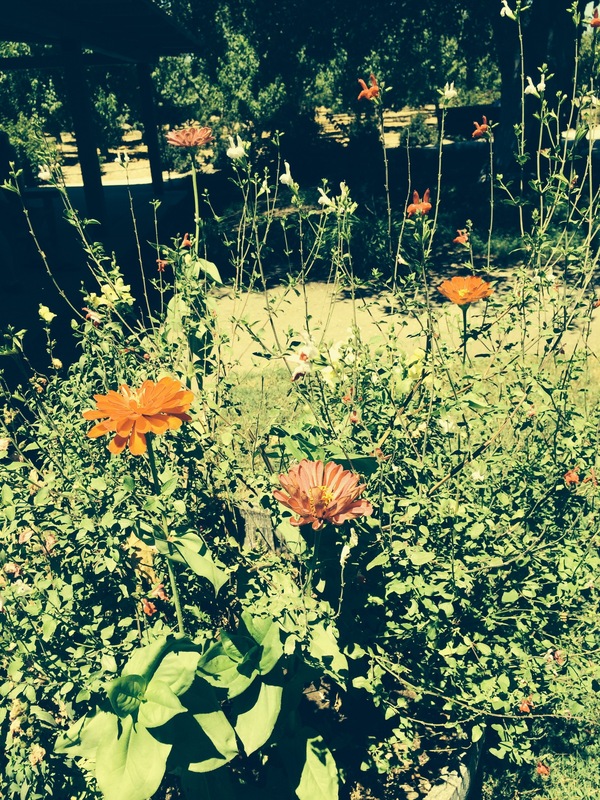 Zinnias and salvia at Buttonwood Farms in the picnic area. 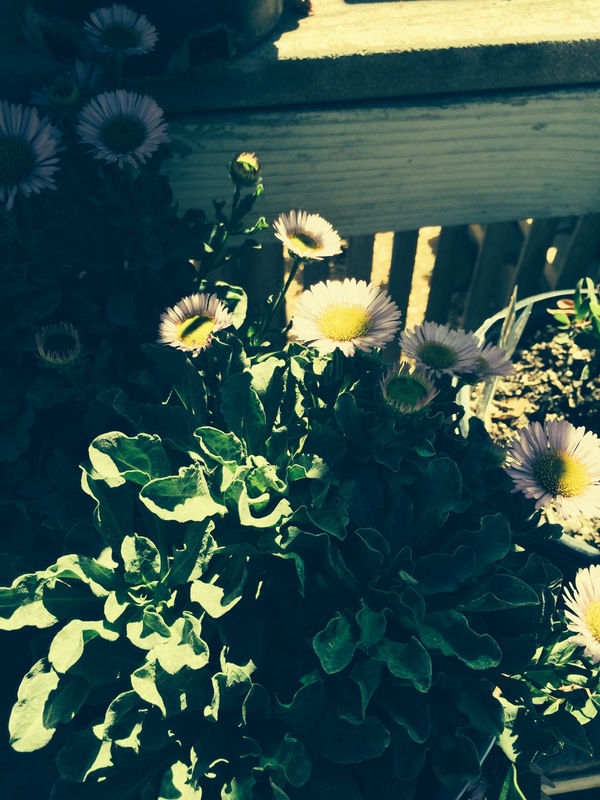 Seaside daisy for sale in Santa Barbara Botanic Gardens, a great place to visit! 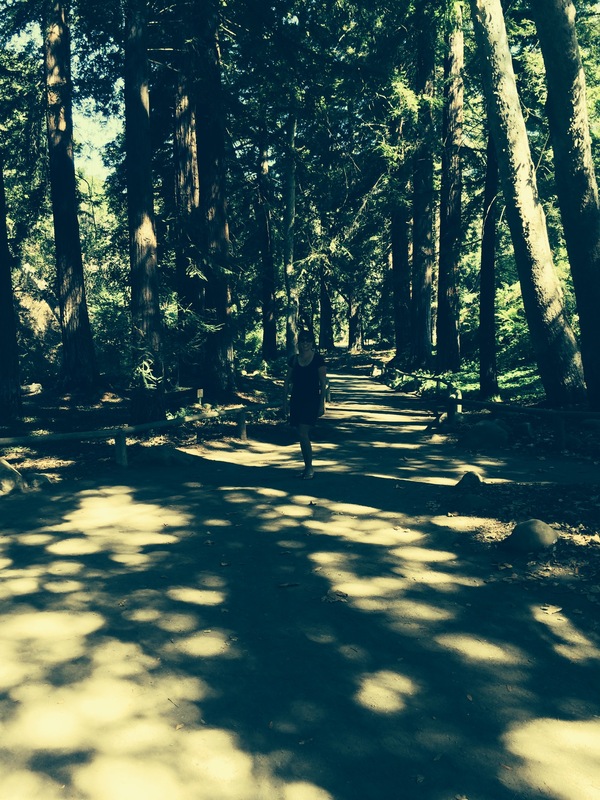 It is great for kids too because there are tons of short trails to walk, shade in the canyons, a cool gift shop, etc. Santa Barbara Bontanic Gardens where you can learn about native plants and drought-tolerant plants, plus get ideas for water features like this one. Now wouldn’t that be nice in your backyard? 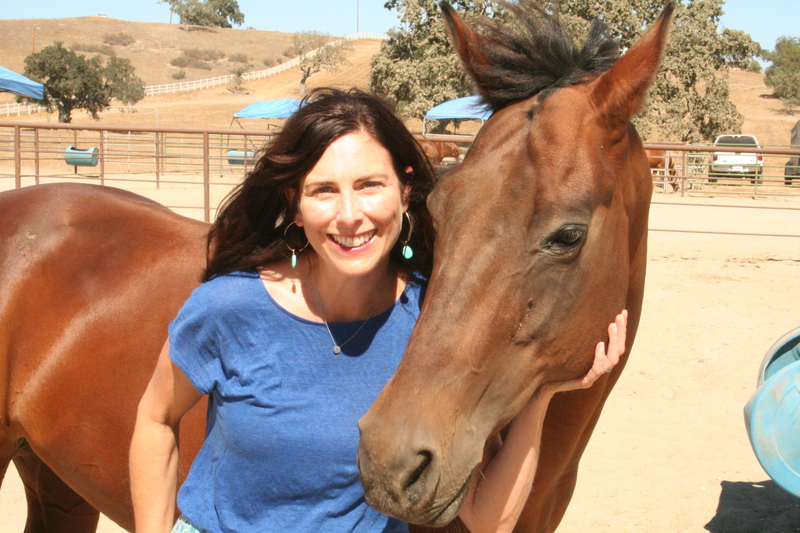 Going to Santa Barbara? 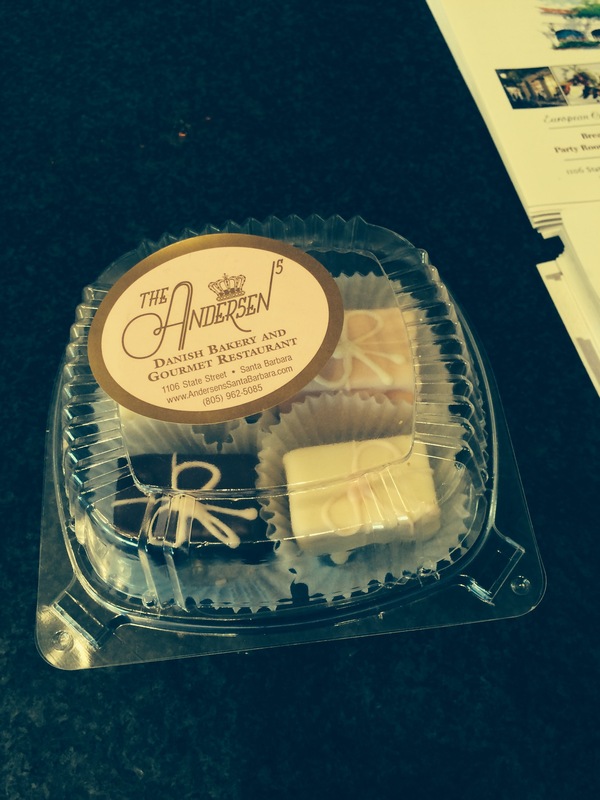 You gotta go to Andersen’s Danish bakery! I just had to throw this in! You get hungry gardening (and visiting gardens). Coastal redwoods in the canyon at the Santa Barbara Botanic Gardens, a place to cool off and slow down. Native plants for sale at Bontanic Gardens. I hauled home three: a verbena (Verbena lilacina “De La Mina”), a coral bells variety native to the Channel Islands (Heuchera maxima) and a Seaside Daisy (Erigeron glaucs). I wanted to buy a lot more but I didn’t. 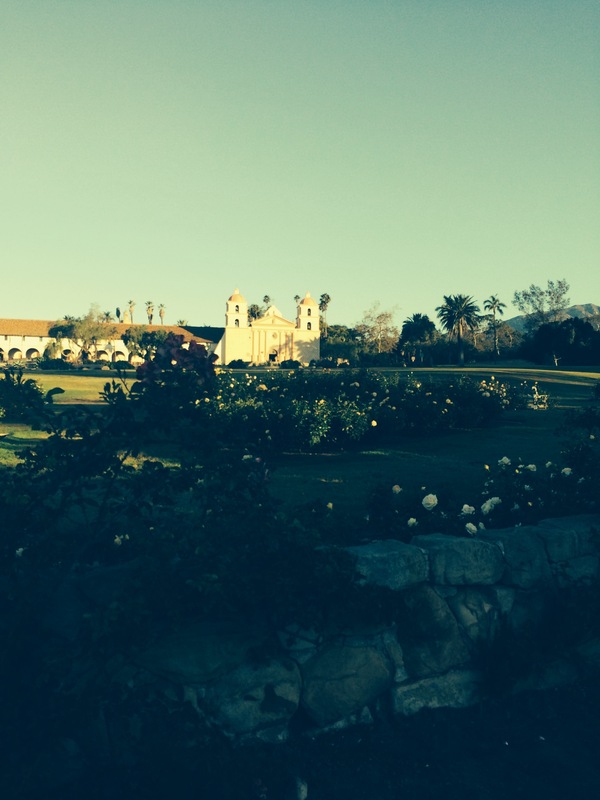 Santa Barbara Mission on a Sunday morning with rose garden in forefront. Overall, it was very dry and dusty but the roses were still in bloom and better than mine at home! Yarrow and verbena bonarensis at Buttonwood Farms. Finally, one of my Carpenteria has bloomed. I planted these plants up on my back hill almost two years ago–here’s a picture of it when I first planted. I don’t know if the warm, dry winter encouraged it or not, but I’m glad it finally bloomed. I noticed little pods forming all over the bush a few weeks ago and finally they opened to reveal a white flower with a bright yellow center. I see one of my other Carpenterias now has pods too so another one will bloom any day. The blooms are pretty and almost look like roses. I think in a few days, the shrub will be covered with blossoms. The soil up on the top of the hill is not too bad, but not too good either –patches of clay everywhere. 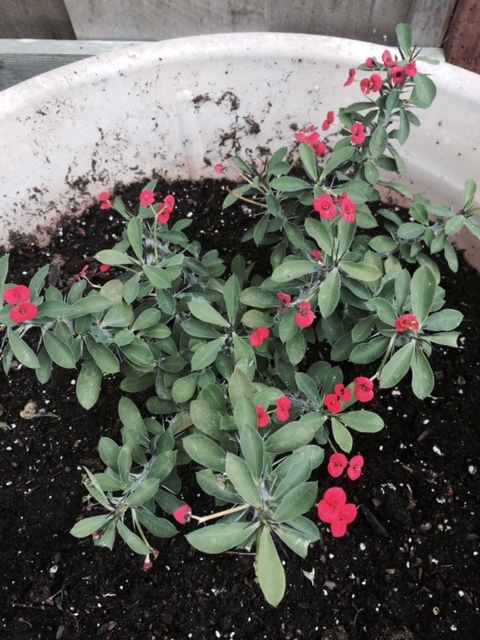 The description of this plant says it lives in clay or loam soil, tolerant of sun or shade. 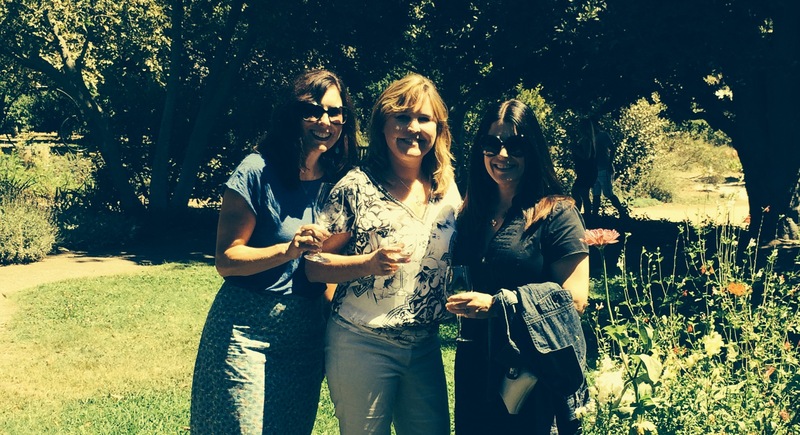 Flowers May through August–yipee! And they are supposed to be fragrant. I guess I better go smell the Carpenteria Californica! I heard the governor on the radio the other day, and it made me realize my yard might not get much water this summer. This is serious stuff. And it is likely to continue into the future. I might as well face the facts. I have decided to delay planting our front yard. Why plant, if I can’t water or shouldn’t water? I am going to wait until the fall when it is cooler. That said, I am also going to plant even more drought-tolerant plants. This poses a problem for my style of gardening — I love cottage gardens. I am not a fan of a cactus or succulent garden; I have seen enough of those growing up in the desert! I am going to search for cottage plants that don’t take water. The one that comes to mind is lavender. My lavender on the “hell strip” by the street never gets water. I spray it for a second or two once in a while to wash off the salts. I think the morning mist waters it. I could plant my whole fountain area in lavender and have a few of those succulents that have the hot pink flowers–Calandrinia spectabilis. It is supposed to be indestructible, which is good. Sage (the herb), salvia, alstoemeria, moonshine yarrow and a native verbena like De La Mina also might be good. I rarely water my alstoemeria once established and it still blooms. I also think artichokes would be nice–of course, they will likely need a little more water. That is one thing I have learned that can be difficult about mixing low water plants with ones that need more water–if you water too much, you kill the drought tolerant ones and if you water too little, well you know. I think you have to pretty much go whole hog with drought tolerant! At least zone your plantings to match your sprinklers so you can have a low water area, and if you need it, an area that needs more sprinkling. Usually the plants will live without water but they just won’t bloom. I have found this true with day lillies. They like water to flower. Of course, grass falls into this category. We have a tiny figure eight of grass, which is ugly anyway due to other grasses mixing in and compacting of the dirt (and holes the dog dug). We could brick it over or try a native grass–no more mowing. Another option is to make the grass even smaller and edge each border with a gravel or river stone then have the grass. I have seen this in larger yards and it looks beautiful. In the shade, I like drought-tolerant ferns: here is the article I have been searching for in Sunset Magazine on ferns that like it dry. 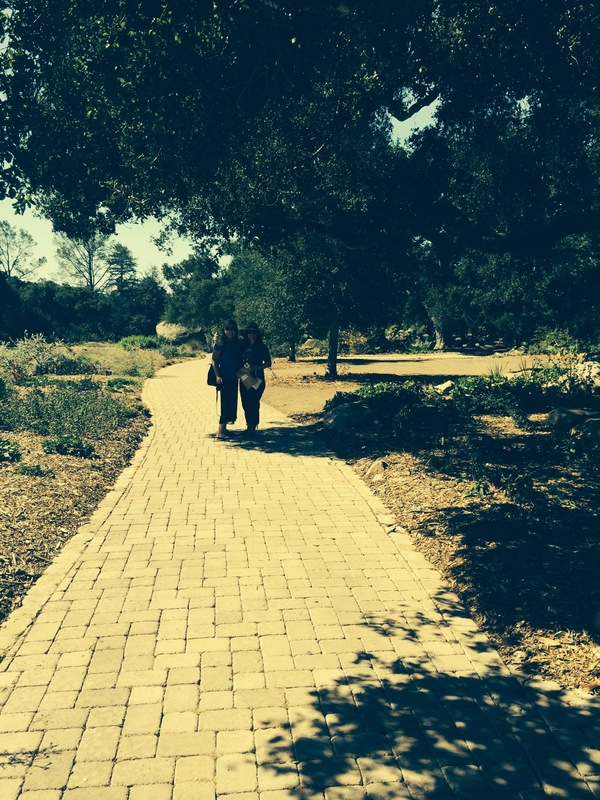 And this article has some other ideas for “wild and romantic” drought tolerant designs. Some of those look pretty. 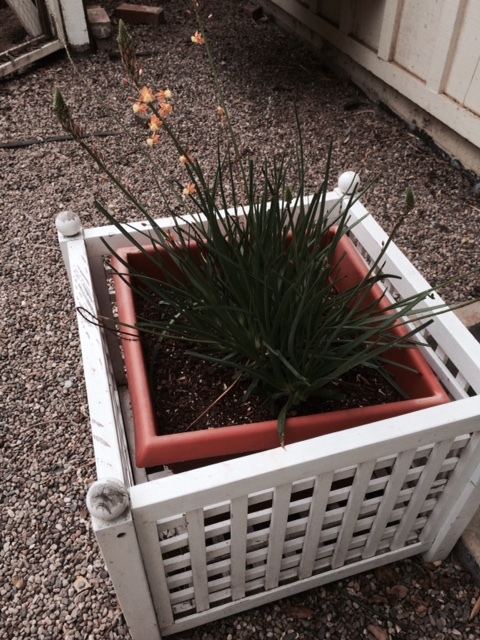 Better Homes And Gardens has some other good garden ideas for drought-tolerant plantings. This page for Intermountain Nursery has a lot of the plants I like. 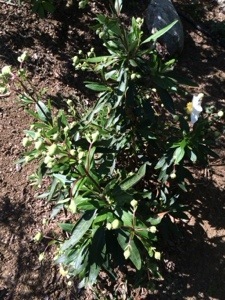 You can see moonshine yarrow, mimulus, and other plants here, including Carpenteria Californica, which is planted on my hill and is about to bloom for the first time. (Maybe it needed a really dry year to bloom.) I am really excited to see it and will post a photo. 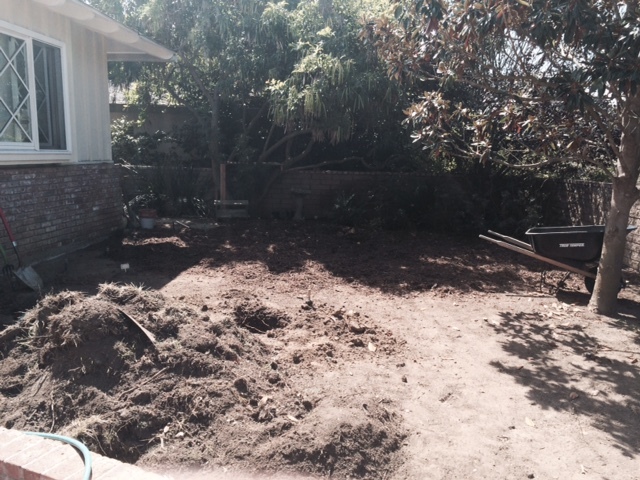 Looks like I will have time to plan this new drought-proof garden all through the hot, long summer.